Accumulated evidence from animal models suggests that exogenously applied stress enhances airway reactivity and increases airway inflammation. This is considered to be the result of their inability to increase glucocorticoid production in response to stress to suppress the immune reaction. Clinical observations that stressful life events in asthmatic subjects increase the risk of a new asthma attack are in agreement with the above mentioned experimental data. Asthmatics not treated with inhaled corticosteroids (ICS) are likely to have an attenuated activity and/or responsiveness of their hypothalamic-pituitary-adrenal (HPA) axis whereas most asthmatic children demonstrate improved HPA axis responsiveness on conventional doses of ICS, as their airway inflammation subsides. Few patients may experience further deterioration of adrenal function, a phenomenon which may be genetically determined. The dominant pathologic feature in asthma is airway inflammation. The characteristic pattern of inflammation in the airways appears to be similar in all clinical forms of the disease, with activation of mast cells and an increase in the number of activated eosinophils and T lymphocytes, which release inflammatory mediators that contribute to the manifestations of the disease . These mediators cause activation of the stress system, which coordinates the adaptive responses of the organism to stressors, maintaining basal and stress-related homeostasis. The stress system influences the activity of many other body systems, including the central nervous, cardiorespiratory, metabolic, endocrine and immune systems, whose functions are closely intertwined . A major component of the stress system is the hypothalamic-pituitary-adrenal (HPA) axis. Stimulation of this axis by inflammatory cytokines (e.g. TNF-α, IL-1, IL-6) results in an increase of systemic glucocorticoids, which, in turn, feed back and suppress the immune and inflammatory reaction . This suppressive activity includes the anti-inflammatory effects of glucocorticoids on the airways. Recent evidence indicates that the balance between systemic and/or local airway anti- and pro-inflammatory actions might be dysregulated in asthmatics . This review focuses on current knowledge regarding the effects of the stress system on airway inflammation. It also provides a brief overview on the role of the HPA axis in asthmatic subjects not treated with inhaled corticosteroids (ICS) and on long-term ICS therapy. The stress and immune systems play crucial roles in maintaining homeostasis [2, 3]. The stress response is coordinated and mediated by the centers of the stress system in the brain, along with their respective peripheral limbs. The centers in the brain consist of the corticotropin-releasing hormone (CRH), the arginine-vasopressin (AVP) neurons of the paraventricular nuclei (PVN) of the hypothalamus, and the brainstem noradrenergic neurons of the locus caeruleus/norepinephrine (LC/NE)–central sympathetic systems. The peripheral limbs include the HPA axis and the systemic sympathetic and adrenomedullary nervous systems. Activation of the central stress system leads to the secretion of CRH and AVP into the hypophysial portal circulation, hence, to the stimulation of pituitary adrenocorticotropic hormone (ACTH) and adrenocortical glucocorticoid secretion. Stress system activation also leads to the stimulation of the systemic sympathetic and adrenomedullary nervous systems, thus, to the peripheral secretion of norepinephrine (NE), epinephrine, and several neuropeptides (Figure 1). Figure 1. Interactions between the stress system. 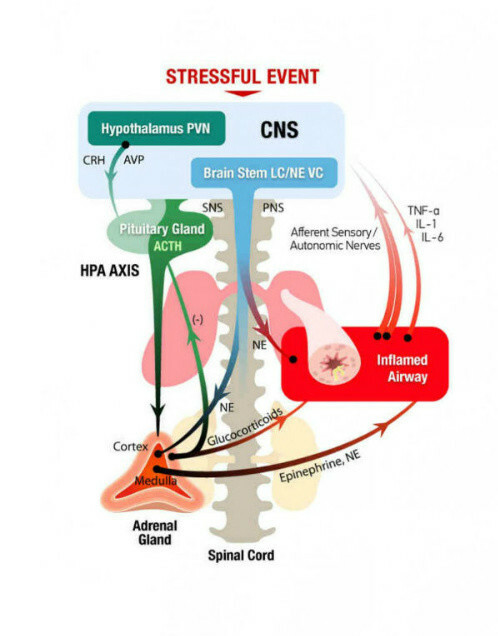 Interactions between the stress system — composed of the hypothalamic-pituitary-adrenal (HPA) axis and the locus caeruleus/ norepinephrine (LC/NE) sympathetic and parasympathetic systems — and an immune and inflammatory response of the airways during a stressful event. The stress response via the brain activates the HPA axis, which produces glucocorticoids as the end-hormone. Additionally, stress can activate the sympathetic nervous system and primary sensory nerves. Whether stress activates or inhibits the immune response is often dependent on the duration, timing and quality of the stressor. Abbreviations: ACTH, adrenocorticotropic hormone; AVP, arginine vasopressin; CNS, central nervous system; CRH, corticotropin-releasing hormone; IL, interleukin; PNS, parasympathetic nervous system; PVN, paraventricular nucleus; SNS, sympathetic nervous system; TNF-α, tumor necrosis factor alpha; VC, vagal complex (modified from reference No 4). The stress system receives information neurally and humorally through the systemic circulation, from injurious agents or signal-carrying molecules, such as hormones, growth factors, neurotransmitters, neuropeptides, cytokines, and other mediators of inflammation . The immune system is responsible for the defense against different injurious agents and the immune or inflammatory response is activated by such agents through several classes of recognition molecules or receptors, such as the Toll-like receptors. Once the magnitude of the immune response exceeds a certain threshold, activation of the stress response also occurs, with effects that antagonize or potentiate those of the immune response. Whether stress activates or inhibits these immune responses is often dependent on the duration and quality of the stress stimulus . The principal peripheral stress hormones glucocorticoids and catecholamines affect major immune functions, such as antigen presentation, lymphocyte proliferation and trafficking, secretion of cytokines and antibodies, as well as selection of the T helper-1 (Th1) versus Th2 response. In the 1970s and 1980s, stress was often regarded as merely immunosuppressive. Recent evidence, however, indicates that stress hormones influence the immune response in a multi-dimensional way; both glucocorticoids and catecholamines systemically mediate a Th2 shift by suppressing antigen presentation and Th1 production and by upregulating Th2 cytokine production. On the other hand, in certain local responses and under certain conditions, stress hormones may actually facilitate inflammation, through redeployment of immune cells, induction of TNF-α IL-1, IL-6, IL-8, and C-reactive protein production or through activation of the CRH-substance P-histamine axis . It is thus becoming increasingly clear that stress hormone-induced inhibition or upregulation of the systemic or local pro- and anti-inflammatory mediator production and the Th1/Th2 balance may affect disease susceptibility and outcome [3, 5-7]. Allergy is a hypersensitivity reaction initiated by immune mechanisms, humoral or cell-mediated; allergic mechanisms are thus of paramount importance in asthma . Since Th2 cells have a primary role in the development of asthma, stress mechanisms may be linked to asthma. The stress and immune systems play crucial roles in maintaining homeostasis [2, 5-7]. Once the magnitude of the immune response towards an injurious agent exceeds a certain threshold, activation of the stress response also occurs, with effects that antagonize or potentiate those of the immune response. Whether stress activates or inhibits these immune responses depends on several critical factors; duration (acute versus chronic) of stress, effects of stress on leukocyte distribution, and the timing of stressor exposure may influence the direction (enhancing versus suppressive) of the effects of stress on immune function . Experimental stress studies in animal models as well as clinical studies in humans provided substantial information about neuroendocrine-immune interaction mechanisms. Data from animal models clearly indicate that stress may produce a marked increase in allergen-induced airway inflammation . Activation of the HPA axis by specific cytokines, such as interleukin (IL)-1, IL-6 increases the release of cortisol, which in turn feeds back and suppresses the immune reaction. A decreased endogenous glucocorticoid production in CRH-knockout mice has been associated with increased airway inflammation with mechanical dysfunction of the airways and increased IL-4, IL-5, and IL-13 levels . However, Joachim et al., reported that exogenously applied stress (mice exposed to sound stress) dramatically enhances airway reactivity and airway inflammation in ovalbumin (OVA)-sensitized and challenged mice, indicating a blunted HPA axis response to stress in allergic individuals [11, 12]. In line with these observations, Silverman et al., reported that the increase in inflammation in CRH-knockout mice is associated with an increase in tissue resistance, elastance and hysteresivity . The authors concluded that CRH deficiency (inherited or acquired) disrupts endogenous glucocorticoid production and enhances allergen induced airway inflammation and lung mechanical dysfunction. The influence of timing of single short restraint stress in a model of eosinophilic airway inflammation was also investigated . The airways of OVA-sensitized mice were exposed to OVA challenge. Short restraint stress applied 2 hours prior to challenge inhibited OVA-induced airway inflammation, whereas 2 hours post-challenge did not affect inflammation. Treatment with metyrapone prior to pre-challenge stress prevented the evoked decrease in inflammation. The authors concluded that the effects of stress on eosinophilic airway inflammation appear to be strongly dependent on timing; HPA axis activation probably influences eosinophilic inflammation through specific sequences of compartmental activation and thereby timing effects are evident on cellular recruitment pattern during the allergic reaction. A significant role of stress in asthma exacerbation in every day clinical practice was proposed in the past [14, 15]. However, it is based on the patient’s and physician’s experience rather than documented evidence. In recent years, there are a few interesting and indicative reports on the subject [16, 17]. A group of asthmatic children were prospectively followed for 18 months. Key measures included asthma exacerbations, high threat life events and chronic stressors. A significant increase in the risk of a new asthma attack immediately after a stressful event and a delayed increase in the risk, 5-7 weeks later, was found. The risk was increased further and brought earlier in time if multiple chronic stressors were present in the child”s life [15, 18]. In a meta-analysis on 34 prospective cohort studies investigating the influence of psychosocial factors on atopic disorders a positive association between psychosocial factors and future atopic disorder was exhibited. More notably, the subgroup meta-analysis on the healthy and atopic disorder populations showed psychosocial factors had both an etiological and prognostic effect on atopic disorders. In their meta-analysis conclusions, the authors suggested the use of psychological in addition to conventional physical and pharmacological interventions, in the successful prevention and management of atopic disorders . In a series of studies, a link between low socioeconomic status and immunologic markers of asthma was demonstrated [20-22]. Asthmatic adolescents of low socioeconomic status had higher eosinophil counts and increased levels of inflammatory cytokines associated with asthma (IL-5, IL-13); they also demonstrated marginally lower morning serum cortisol values than those of the high socioeconomic status group, a possible indication of a less active HPA axis in the former. Lower socioeconomic status was also associated with higher emotional stress and perceived threat as well as lower socioeconomic status was associated with higher levels of cortisol in saliva and 24-hour urine epinephrine. Higher levels of stress and perception of threat were associated with heightened production of IL-5 and IL-13, and higher eosinophil counts in the children with asthma compared to healthy controls. Statistical tests revealed that chronic emotional stress and threat perception represented significant mediation pathways between socioeconomic status and immune processes in children with asthma. A pilot study, which indicated that sustained stressful life events, such as academic examinations, alter the pattern of cytokine release in asthmatic individuals, was followed by another study by the same group ; their goal was to investigate the effect of a relatively chronic stressful life event on allergic inflammatory response to allergens. An airway antigen challenge was performed in 20 college students with asthma during a low-stress phase (midsemester or two weeks postfinal examination) and a high-stress phase (final examination week). Sputum eosinophils and eosinophil-derived neurotoxin levels significantly increased 6 and 24 hours post-challenge and were enhanced during the high-stress period. Production of IL-5 by sputum cells was also increased 24 hours post-challenge; this resulted in a greater decrease in the IFN-γ/IL-5 ratio during the week of examinations and correlated with airway eosinophils . These data raise the possibility that allergen-induced airway eosinophilia can be significantly augmented during a period of stress. The association between stress and decreased ability of peripheral blood lymphocytes to synthesize IFN-γ when stimulated in vitro has been reported [25, 26]. However, the observation of an increase in IL-5 and a shift toward a Th2 phenotype in airway cells in asthmatic patients during stress is novel and may indicate an alteration in airway inflammation. In a study of children predisposed to atopy on the basis of their family history, the influence of reported parental caregiver stress in the first 6 months of their child’s life on the lymphocyte allergen-specific proliferative response, cytokine production, and total IgE expression, at 2-3 years of age was examined . It was demonstrated that higher early-life chronic caregiver stress was associated with an enhanced allergen-specific proliferative response, a respectively increased and decreased production of TNF-α and IFN-γ by stimulated peripheral blood mononuclear cells and increased total IgE expression. According to the above mentioned clinical data, exposure to stress in early development might result in functional changes in immune reactivity in susceptible children potentiating the inflammatory response. Therefore, this could be considered as the allostatic or, more correctly, cacostatic load, i.e. the disease burden or cost the body has to pay for maintenance of stability outside of the normal homeostatic range (allostasis or, more correctly, cacostasis) . Figure 2 depicts the conceptual model through which the stress response to various stressors may influence the HPA axis and exacerbate the disease in asthmatic children. There is also evidence that stressful life experiences diminish expression of genes encoding the glucocorticoid and the beta2-adrenergic receptors in children with asthma . In 77 children chronic stress was associated with reduced expression of the mRNA of the beta2-adrenergic receptor among children with asthma. The findings that chronic stressors facilitate childhood asthma exacerbations are supported by more recent observational studies on the role of the social environment in children and adolescents with asthma ; in addition, victimization and missed school because of feeling unsafe are important but poorly understood risk factors for asthma morbidity that pertain to a large population of children and adolescents . In line with the above mentioned clinical observations, a series of recent findings have formed the basis for the fetal programming of asthma hypothesis, which proposes that stress experienced during pregnancy may lead to vulnerability of the immune system towards atopic diseases and asthma [32, 33]. In experimental setting it has been shown that stress during pregnancy aggravates asthma in the offspring in later life by severe alteration of the immune response to allergens and likely by impairment of lung organogenesis . In a birth cohort study in Manitoba, Canada, using health care and prescription databases, the association between maternal distress during the first year of life and onward, and asthma at age 7 was assessed. An increased risk of childhood asthma among children exposed to continued maternal distress from birth until age 7 was demonstrated. Exposure to maternal depression and anxiety limited to the first year of life did not have a demonstrable association with subsequent asthma . However, a positive association between maternal anxiety symptoms during pregnancy and subsequent asthma in the offspring during childhood was also recently observed . Viral infection of the respiratory tract not only is the most common precipitant of acute asthma exacerbations but may also induce nonspecific airway hyper-responsiveness (AHR) in allergic or even non-allergic children [37-40]. Therefore, stress response to viral respiratory infection is of special interest. Viral infection of the respiratory tract induces a series of defense responses designed to terminate viral replication. The first is a rapid-onset innate response which involves the synthesis of interferons and the stimulation of natural killer lymphocytes. If the infection progresses, the adaptive immune response with its humoral and cell-mediated arms ensues . During the early, innate immune response to viral infections, the pro-inflammatory cytokines TNF-α, IL-1, and IL-6 are induced to aid in the process of anti-viral immunity. However, cytokine receptors have been detected at all HPA axis levels and therefore, each level can serve as an integration point for immune and neuroendocrine signals; the effects of innate pro-inflammatory cytokines — TNF-α , IL-1, and IL-6 — on HPA axis function, have been studied the most [42-44]. 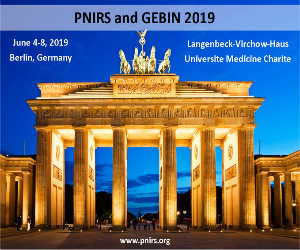 In an experimental murine infection with influenza A/PR8 virus, a down regulation of pro-inflammatory cytokines by stress has been demonstrated . The same group of researchers examined the lifelong effects of neonatal stress on the response to a viral influenza infection and they found that maternal separation disrupted the regulation of innate resistance resulting in enhanced cytokine responses in the lungs during an infectious challenge . It is also of interest that influenza-induced corticosterone secretion was blunted in maternally separated mice, suggesting that the increase in immune reactivity to the virus was due to lack of glucocorticoid feedback control. Early life stress, such as maternal separation, has been associated with a decrease of glucocorticoid receptor binding in the hippocampus and hypothalamus, an increase of hypothalamic CRH, and eventually an augmented activity of the HPA axis through disruption of glucocorticoid negative feedback control . Similarly, in a recent report, early postnatal stimulative or adverse experiences in rats exerted long-lasting changes of the ‘neuroendocrine-immune’ interface in adulthood, resulting in either protective or aggravating mechanisms in allergic airway disease . Consequently, long lasting effects of negative life events have implications for the host immune status and susceptibility to infections throughout life and may be the basis for the individual differences in host susceptibility to infection. Moreover, differences in the effects of stress on the HPA axis during an infectious challenge might exist between asthmatic and other populations augmenting the allergic inflammatory response of the former. Certain cytokines in response to acute psychological stressor activate the HPA axis, causing increased glucocorticoid secretion resulting in protection from cytokine-mediated pathology. Even in the case of acute or chronic CRH deficiency there are alternative neuroendocrine pathways through which virus-induced immune responses influence a glucocorticoid response . It has been demonstrated that during the acute period of respiratory syncytial virus (RSV) infection, there is an increase in the level of plasma cortisol . Although this increase was observed in infants with mild and severe disease, an imbalance of the Th1/Th2 response, with a deficient type 1 response, was present only in those cases with severe bronchiolitis and higher levels of plasma cortisol. A natural Th1/Th2 switch with a shift to a Th2 profile of cytokine production is further evidenced by the increased endogenous cortisol production under stress conditions. A glucocorticoid receptor antagonist was used in mice to confirm that the effects of stress on cell trafficking and cytokine production were mediated by elevated corticosterone . In this experimental model, the induction of elevated glucocorticoids by an acute psychological stressor was associated with a reduction in lung pathology and increased survival following a respiratory viral infection . Epidemiologic observations demonstrated that chronic stress was associated with acute respiratory episodes in adults ; a similar association between maternal stress and more frequent and severe children’s respiratory symptoms was also reported . In clinical practice, higher psychological stress before viral challenge (influenza A virus) was associated with greater symptom scores, greater mucus weights, and higher IL-6 lavage concentrations in response to infection . Low childhood socioeconomic status, possibly associated with chronic stress, was also pointed out as a risk factor for developing a common cold when exposed to a rhinovirus . 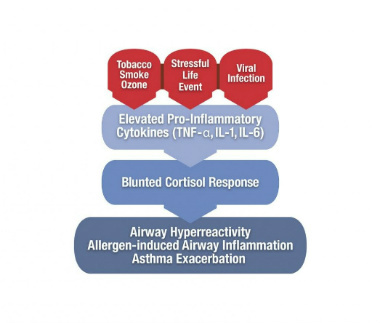 Therefore, the attenuated host defense responses to viral infection under stress conditions may facilitate airway reactivity, therefore enhancing childhood asthma exacerbations (Figure 2). Figure 2. Conceptual model. Conceptual model highlighting the pathway through which the stress response influences the manifestations of asthma in children. The elevated pro-inflammatory cytokines, such as TNF-α, IL-1, and IL-6, are the principal conduits between the stress and immune system; they may induce a state of hypo-responsiveness of the HPA axis, whereby attenuated cortisol secretion and exacerbation of allergic airway inflammation ensue. The probability that other systems and/or other effector cells may be implicated in a biologic cascade resulting in similar endpoints cannot be excluded at the present time (modified from reference No 4). Evidence from animal experiments suggests that early psychological and physical stress may aggravate asthma later in life by inducing hypo-responsiveness of the HPA axis . In addition, various stressors during the early part of a child”s life may affect the HPA axis and thus dysregulate immune system function with implications for the development of asthma . A low HPA axis activity in allergic patients has been reported in a large number of clinical studies. Initially, research was focused on the HPA axis of asthmatics who were on long-term treatment with ICS; however, a growing number of studies subsequently recognized that allergic/asthmatic patients not treated with ICS were also likely to have an attenuated activity and/or responsiveness of their HPA axis . Buske-Kirschbaum et al., demonstrated reduced cortisol levels in response to psychosocial stress in children and adults with atopic dermatitis, pointing to a dysfunction of the HPA axis in patients with this disorder [60, 61). The same group also found that children with allergic asthma showed significantly attenuated cortisol responses to psychosocial stress when compared with matched healthy controls . On the same line of thought, another group, in a large community sample of adolescents, of whom approximately one third had an atopic disorder, found a lower cortisol response to the stressor of laboratory procedures . Furthermore, a reverse association between adrenal and bronchial responsiveness in asthmatic children was reported, showing that children with more severe disease may have relative adrenal insufficiency compared to those with milder disease . There are two recent interesting reports on HPA axis function in allergic subjects. In the first, the circadian rhythm of salivary cortisol was evaluated in infants with an increased risk for allergic disease . Thus, infants of mothers with allergy or asthma or an asthmatic father exhibited flattening of the circadian cortisol rhythm because of diminution of the expected morning surge of cortisol. In the second study, the basal and synacthen-stimulated morning plasma cortisol concentrations of wheezing infants aged 5 to 9 and 9 to 12 months were evaluated by high-performance liquid chromatography . In general, mean basal plasma cortisol concentrations were similar in the two age groups and increased to comparable levels 60 min after synachten administration. However, both groups had a wider range of basal and stimulated values than older children, with approximately 15% of these infants below the normal range of basal or stimulated plasma cortisol concentrations. A low adrenocortical response during a pre-treatment evaluation of poorly controlled asthmatics has been previously reported, but was not commented upon as an important finding. Indeed, Volovitz et al.,  found that 60 min after ACTH administration during the standard synacthen stimulation test, serum cortisol concentrations in 4 out of 15 asthmatic children were lower than 496.6 nmol/L, while cortisol suppression was no longer present when these children were clinically controlled by budesonide therapy. 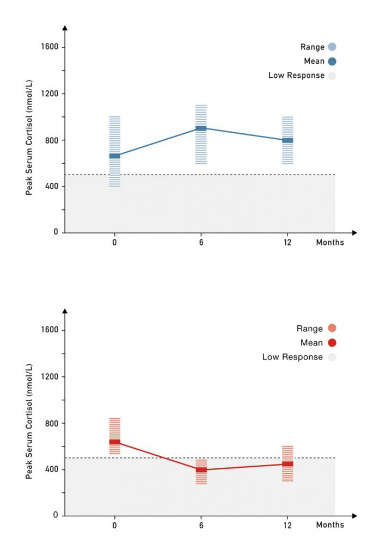 In another study by Kannisto et al., , cortisol values were obtained during the low-dose synacthen test (LDST) before the patients were started on ICS treatment. The authors recognized that asthmatic patients had peak post-stimulation serum cortisol levels that were lower (330 nmol/L) than normally expected (i.e. 500 nmol/L). Similarly, Ozbec et al., using the same diagnostic protocol, found that their patients also had lower peak cortisol values (389 and 438 nmol/L) than the lower limit of normal cortisol response . Finally, Bacharier et al., reported that 4 out of 45 children receiving long-term treatment with nedocromil or placebo, but not ICS, demonstrated abnormally low serum cortisol levels during the ACTH stimulation test . In line with these observations, we reported the results of a prospective 12-month study of a cohort of 41 pre-adolescent asthmatic children that were placed on long-term treatment with inhaled budesonide and followed by serial LDSTs. Approximately 10% of our cohort had a low adrenal reserve before starting any ICS treatment. These patients, as well as more than half of the remaining cohort, showed improved adrenal responses while receiving long-term ICS (Figure 3) . Figure 3. Adrenal response. Adrenal response to a low-dose synacthen test in asthmatic children before and on maintenance of ICS treatment. Most asthmatics have an improvement of their hypothalamic-pituitary-adrenal axis responsiveness while on conventional doses of ICS (green), whereas, conversely, adrenal suppression is evident in a subgroup of patients (red). A low adrenal response in poorly controlled asthmatics may be observed during pre-treatment evaluation (green), as cytokines involved in the pathophysiology of asthma appear to be inversely related to cortisol production. ICS, inhaled corticosteroids (modified from reference No 58). These findings support the concept that chronic allergic disease, regardless of the organ affected, may be associated with reduced activity and/or responsiveness of the HPA axis. Production of certain allergic inflammation-related cytokines may blunt the response of the HPA axis to both inflammation and acute stress, contributing to the aggravation of allergic inflammation because of insufficient anti-inflammatory restraint. The heterogeneity in glucocorticoid responsiveness may reflect the variety of mechanisms involved in HPA axis regulation and the multiple cytokines involvement with stimulatory or inhibitory actions on the HPA axis [72-74]. There is a large amount of data regarding the safety profile of ICS on the HPA axis [75, 76]. However, the clinical importance of studies of HPA axis function lies in their ability to identify which children placed on ICS therapy will not be able to properly respond to stress. Basal state HPA axis tests are generally inferior in diagnosing HPA suppression, while dynamic testing has the advantage of providing an assessment of stress reserve [77-79]. Although the insulin tolerance (ITT) and metyrapone tests have been considered by some physicians as the gold standard of adrenal function tests, both include risks and are practically of limited use; ITT has been linked to deaths in children, while metyrapone is usually unavailable . As first line alternatives, the corticotropin-releasing hormone (CRH) stimulation test, as well as the short synacthen test (SST) have been proposed and are usually employed . The conventional high dose of intravenous injection of 250 μg is primarily useful in determining severe and clinically important adrenocortical insufficiency. This test produces supra-physiologic ACTH levels in the circulation and might occasionally provide false negative results, even in patients with a clinically impaired adrenal reserve. A variation of the SST is the LDST (0.5-1.0 μg) that is considered more accurate in assessing physiologic cortisol secretion and more sensitive in detecting evolving or mild adrenal suppression [79-81]. The salivary low-dose ACTH test yields results that parallel the response of circulating cortisol and may provide an alternative to blood testing [82-84]. The recent GINA (Global Strategy for Asthma Management and Prevention) report correctly concludes that although differences exist between the various ICSs and the inhalation devices employed, treatment with the recommended doses of an ICS is usually not associated with any clinically significant suppression of the HPA axis in children. With higher doses, small changes in adrenal function can be detected with sensitive methods . We reported that 20% of asthmatic children on long-term treatment with low to moderate doses of inhaled budesonide had mild biochemical adrenal suppression (LDST) that was not related to the ICS dosage or duration of treatment . Adrenal suppression in asthmatic children on even moderate doses of ICS has also been detected by LDST by other researchers . A flat adrenal response in the LDST was also reported in 2.8% of asthmatic children receiving maintenance fluticasone propionate, whereas impaired responses were observed in 39.6% of children receiving more than 1000 µg of fluticasone per day . Reduced basal salivary cortisol levels in school-aged children with asthma and allergic disease were recently reported . The lowest salivary cortisol levels were found in asthmatic children using moderate to high ICS doses, but also children with combined asthma and allergic rhinitis on no or low dose ICS had significantly lower salivary morning and evening cortisol levels than did children with asthma alone with no or low dose ICS. In a 12-month observational study of 35 prepubertal asthmatic children requiring at least 1000 µg/day of budesonide or equal potency of fluticasone propionate, 46% of the subjects had evidence of biochemical adrenal suppression demonstrated with the LDST . In a survey of adrenal crises associated with inhaled corticosteroids in the United Kingdom, 33 patients (28 children, five adults) met the diagnostic clinical and biochemical (abnormal SST or glucagon stimulation test) criteria for an adrenal crisis . Most of these patients were on fluticasone metered dose inhaler with a spacer and on very high doses ranging between 500-2000 μg/day. Twenty-three children had acute hypoglycemia, one associated with coma, convulsions and death. In 65% of the patients there was no obvious precipitating cause, in the rest there was evidence of a stressful event or a reduction/discontinuation of ICS. A systematic review of the literature was recently performed by Pedersen focusing on randomized, controlled studies of 12 months or more duration, to identify studies examining each of the following three areas: growth, bone mineral density and cortisol levels . Ten studies met the inclusion criteria for cortisol levels. It was determined that recommended doses of ICS generally had little or no effect on plasma- or urinary-cortisol levels vs. nonsteroidal therapies. From the aforementioned studies, it is obvious that a dose-dependent adrenal suppression in asthmatic children on ICS does exist, and may be detected even when small to moderate doses of inhaled corticosteroids are employed. We do not know whether these children would develop symptomatic adrenal insufficiency if they were treated with larger doses, but it is certainly possible. Sometimes the results of various studies appear contradictory. This could be due to the fact that they may have been derived by various testing methods with different abilities to detect HPA axis impairment, for instance morning serum cortisol or urinary free cortisol concentrations are generally poor discriminators of adrenal hypo-activity. Recent research has disclosed interesting data regarding the role of genetics in modifying the risk of impaired stress response in asthma. A number of pathways through which stress may impact asthma expression could potentially be associated with genetic factors. The most important of these pathways include the ones that influence immune development and airway inflammation, including HPA axis, adrenergic system and cytokine pathway genes . Early-life experiences interact with a child’s genotype to influence the developing immune and stress systems in a fashion that would predispose to or protect from asthma and other allergic diseases [93-95]. The Childhood Origins of Asthma project evaluated children from birth to 3 years, who were at high risk for asthma, to study the relations among environmental and genetic factors and the development of atopic diseases. For the entire cohort, cytokine responses did not develop according to a strict Th1 or Th2 polarization pattern during infancy. First year wheezing illnesses caused by respiratory viral infection were the strongest predictor of subsequent third year wheezing. Also, genotypic variation interacted with environmental factors, including day care, and was associated with clinical and immunological phenotypes that may precede the development of asthma [93, 96]. Researchers have reported on various associations between asthma and genes related to HPA axis activity. Indeed, single nucleotide polymorphisms of such genes determined an individual’s ability to respond favorably to ICS therapy regarding severity of asthma symptoms or a faster improvement of lung function. A relation between an individual’s lung function improvement in response to 8 weeks of ICS therapy and a polymorphism of the CRH receptor type 1 has been suggested . An ACTH receptor promoter polymorphism (CCC/CCC) that results in a lower promoter activity in vitro and is associated with a lower cortisol secretion to prolonged ACTH stimulation in vivo has also been described . This polymorphism might influence cortisol homeostasis under stress conditions. In an haplotype analysis of the glucocorticoid receptor gene a three-marker haplotype across intron B that includes a single nucleotide polymorphism altering a BclI site was found; this was associated with enhanced sensitivity to glucocorticoids, which also might be predisposing to a better response to ICSs . In another interesting study, a significant difference in salivary cortisol responses to psychosocial stress between three polymorphisms of the glucocorticoid receptor gene (BclI RFLP, N363S, ER22/23EK) was detected . Compared with subjects with two wild-type alleles, N363S carriers showed a markedly greater cortisol response during a standardized stress test (Trier test), whereas the mean cortisol response in BclI homozygotes and heterozygotes was attenuated. Variations in the Toll-like receptors type 2 were shown to confer susceptibility to severe infection and severe atopic dermatitis, but were also associated with reduced susceptibility to asthma and allergies in children [101-103]. Furthermore, in TLR-2–/– mice the release of inflammatory cytokines – including TNF-α, IL-1, and IL-6 – from immune cells or fibroblasts after exposure to inflammatory stimuli was impaired . Absence of TLR-2 in mice was also associated with marked cellular alterations in adrenocortical tissue, reduced plasma corticosterone levels and elevated plasma ACTH levels suggesting a possible impairment of the HPA axis at the level of the adrenal gland, even under basal conditions . Oxidant/antioxidant imbalance is a major cause of cell damage and glutathione is a vital intra- and extra-cellular protective antioxidant against oxidative stress, which plays a key role in the control of signaling and pro-inflammatory processes in the lungs. Glutathione-S-transferase (GST) is one of the fundamental antioxidant systems in oxidant-induced lung injury and inflammation . The maternal GST P1 Val105/Val105 genotype was associated with offspring lung function . Children with asthma who are homozygous for the GSTP1 Val105 allele have substantially larger deficits in forced vital capacity, forced expiratory volume in 1 second, and maximal mid-expiratory flow than children without asthma and preschool age children with the same polymorphism are more susceptible to atopic dermatitis [108, 109]; an association between the number of glutathione-S-transferase M1 mutant alleles in the genotype and risk for atopy has also been observed . Polymorphisms in the proinflammatory cytokine TNF genes have been associated with asthma and atopy . In human studies of ozone exposure, polymorphisms in oxidative stress genes (NQO1, GSTM1, GSTP1) modify respiratory symptoms, lung function, biomarkers and risk of asthma. Inflammatory gene polymorphisms (TNF) influence the lung function response to ozone, and the effect of different levels of ozone on the development of asthma. Polymorphisms in oxidative stress genes (GSTM1, GSTP1) alter the response to combined exposure to ragweed pollen and diesel exhaust particles. Importantly, polymorphisms in an oxidative stress gene (GSTM1) have predicted patients with asthma who benefit from antioxidant supplementation in Mexico City, which has chronically high ozone exposure. [112-115]. Therefore, there is good evidence that genes are involved in altering the risk of asthma and allergies in children; various pathways through which stress may affect asthma expression are possibly genetically determined. Moreover, recent data suggest that epigenetic programming of gene expression profiles is sensitive to the early-life environment, and epigenetic alterations early in life can have a life-long lasting impact on gene expression and thus on the phenotype, including susceptibility to disease. . Experimental studies provide substantial in vitro data indicating that DNA methylation of genes critical to T helper cell differentiation may induce polarization towards or away from an allergic phenotype. Thus, asthma risk may be modified by epigenetic regulation [117, 118]. The stress system coordinates adaptive responses of the organism to stressors of any kind; inappropriate responsiveness may account for a variety of disorders. Asthma and allergy is characterized by a dysregulation of the pro-inflammatory versus anti-inflammatory and Th1 versus Th2 cytokine balance. The development of these conditions primarily depends on the genetic and epigenetic vulnerability of the individual, and the duration and timing of the stressful events. A number of factors, including psychosocial stress, viral infection, environmental pollutants and allergy may influence the stress response, resulting in immune response dysregulation causing asthma. There is also good evidence that genes involved in the stress and inflammatory response may affect asthma expression. Pro- and anti-inflammatory cytokines involved in the pathophysiology of allergic disease, regardless of the target organ affected, appear to be inversely associated with cortisol production. In line with this concept, the anti-inflammatory properties of ICS may have favorable effects on the HPA axis of asthmatics with a subnormal adrenal response at baseline improving during successful long-term treatment. On the other hand, some patients may experience further deterioration of adrenal function, a phenomenon which may be genetically determined. As a rule, when ICS are administered at higher than conventional doses, they may be associated with secondary adrenal insufficiency. Elenkov IJ, Chrousos GP. Stress system – organization, physiology and immunoregulation. Neuroimmunomodulation 2006; 13(5-6):257-267. Chrousos GP. The hypothalamic-pituitary-adrenal axis and immune-mediated inflammation. N Engl J Med 1995; 332(20):1351-1362. Priftis KN, Papadimitriou A, Nicolaidou P, Chrousos GP. Dysregulation of the stress response in asthmatic children. Allergy 2009; 64(1):18-31. Dhabhar FS. Enhancing versus suppressive effects of stress on immune function: implications for immunoprotection and immunopathology. Elenkov IJ. Neurohormonal-cytokine interactions: implications for inflammation, common human diseases and well-being. Neurochem Int 2008; 52(1-2):40-51. Calcagni E, Elenkov I. Stress System Activity, Innate and T Helper Cytokines, and Susceptibility to Immune-Related Diseases. Ann NY Acad Sci 2006; 1069:62-76. Johansson SG, Bieber T, Dahl R, et al. Revised nomenclature for allergy for global use: Report of the Nomenclature Review Committee of the World Allergy Organization, October 2003. J Allergy Clin Immunol 2004; 113(5):832-6. Silverman ES, Breault DT, Vallone J, et al. Corticotropin-releasing hormone deficiency increases allergen-induced airway inflammation in a mouse model of asthma. J Allergy Clin Immunol 2004; 114(4):747-754. Quarcoo D, Pavlovic S, Joachim RA. Stress and Airway Reactivity in a Murine Model of Allergic Airway Inflammation. Neuroimmunomodulation 2009; 16(5):318-324. Joachim RA, Sagach V, Quarcoo D, Dinh QT, Arck PC, Klapp BF. Effect of stress on eotaxin and expression of adhesion molecules in a murine model of allergic airway inflammation. J Neuroimmunomodul 2007; 182(1-2):55-62. Joachim RA, Cifuentes LB, Sagach V, et al. Stress induces substance P in vagal sensory neurons innervating the mouse airways. Clin Exp Allergy 2006; 36(8):1001-1010. Kumlien Georén S, Olgart Hoglund C, Tcacencu I, Wikstrom AC, Stierna P. Timing-dependent effects of restraint stress on eosinophilic airway inflammation in mice. Neuroimmunomodulation 2008; 15(3):157-164. Demoly P, Crestani B, Leroyer C, Magnan A, Mounedji A, Humbert A. Control and exacerbation of asthma: a survey of more than 3000 French physicians. Allergy 2004; 59(9):920-926. Sandberg S, Paton J, Ahola S, et al. The role of acute and chronic stress in asthma attacks in children. The Lancet 2000; 356 (9234):982-987. Chen E, Miller GE. Stress and inflammation in exacerbations of asthma. Brain Behav Immun 2007; 21(8):993-999. Rosenkranz MA, Busse WW, Johnstone T, et al. Neural circuitry underlying the interaction between emotion and asthma symptom exacerbation. Proc Natl Acad Sci USA 2005; 102(37):13319-13324. Sandberg S, Jarvenpaa S, Penttinen A, Paton JY, McCann DC. Asthma exacerbations in children immediately following stressful life events: a Cox’s hierarchical regression. Thorax 2004; 59(12):1046-1051. Chida Y, Hamer M, Steptoe Α. A bidirectional relationship between psychosocial factors and atopic disorders: a systematic review and meta-analysis. Psychosom Med 2008; 70(1):102-116. Chen E, Fisher EB, Bacharier LB, Strunk RC. Socioeconomic status, stress, and immune markers in adolescents with asthma. Psychosom Med 2003; 65(6):984-992. Chen E, Hanson MD, Paterson LQ, Griffin MJ, Walker HA, Miller GE. Socioeconomic status and inflammatory processes in childhood asthma: The role of psychological stress. J Allergy Clin Immunol 2006; 117(5):1014-1020. Cohen S, Doyle WJ, Baum A. Socioeconomic status is associated with stress hormones. Psychosom Med 2006; 68(3):41-50. Kang D, Coe C, McCarthy DO, et al. Cytokine profiles of stimulated blood lymphocytes in asthmatic and healthy adolescents across the school year. J Interferon Cytokine Res 1997; 17(8):481-487. Liu LY, Coe CL, Swenson CA, Kelly EA, Kita H, Busse WW. School examinations enhance airway inflammation to antigen challenge. Am J Respir Crit Care Med 2002; 165(8):1062-1067. Dobbin JP, Harth M, McCain GA, Martin RA, Cousin K. Cytokine production and lymphocyte transformation during stress. Brain Behav Immun 1991; 5(4):339-348. Paik IH, Toh KY, Lee C, Kim JJ, Lee SJ. Psychological stress may induce increased humoral and decreased cellular immunity. Behav Med 2000; 26(3):139-141. Wright RJ, Finn P, Contreras JP, et al. Chronic caregiver stress and IgE expression, allergen-induced proliferation, and cytokine profiles in a birth-cohort predisposed to atopy. J Allergy Clin Immunol 2004; 113(6):1051-1057. McEwen BS. Protective and damaging effects of stress mediators. N Engl J Med 1998; 338(3):171-179. Miller GE, Chen E. Life stress and diminished expression of genes encoding glucocorticoid receptor and 2-adrenergic receptor in children with asthma. Proc Natl Acad Sci U S A 2006; 103(14):5496-5501. Chen E, Chim LS, Strunk RC, Miller GE. The Role of the social environment in children and adolescents with asthma Am J Respir Crit Care Med 2007; 176(7):644-649. Swahn MH, Bossarte RM. The associations between victimization, feeling unsafe, and asthma episodes among US high-school students. Am J Publi Health 2006; 96(5):802-804. Bach JF. The effect of infections on susceptibility to autoimmune and allergic diseases. N Engl J Med 2002; 347(12):911-920. Knackstedt MK, Hamelmann E, Arck PC. Mothers in stress: consequences for the offspring. Am J Reprod Immunol 2005; 54(2):63-69. Pincus-Knackstedt MK, Joachim RA, Blois SM, et al. Prenatal stress enhances susceptibility of murine adult offspring toward airway inflammation. J Immunol 2006; 177(12):8484-8492. Kozyrskyj AL, Mai X-M, McGrath P, HayGlass KT, Becker AB, MacNeil B. Continued exposure to maternal distress in early life is associated with an increased risk of childhood asthma. Am J Respir Crit Care Med 2008; 177(2):142-147. Cookson H, Granell R, Joinson C, Ben-Shlomo Y, Henderson AJ. Mothers” anxiety during pregnancy is associated with asthma in their children. J Allergy Clin Immunol 2009; 123(4):847-53.e11. Johnston SL, Pattemore PK, Sanderson G, et al. Community study of role of viral infections in exacerbations of asthma in 9-11 year old children. BMJ 1995; 310(6989):1225-1228. Dakhama A, Lee YM, Gelfand EW. Virus-induced airway dysfunction: pathogenesis and biomechanisms. Pediatr Infect Dis J 2005; 24(11 Suppl):S159-S169. Papadopoulos NG, Xepapadaki P, Mallia P, et al. Mechanisms of virus-induced asthma exacerbations: state-of-the-art. A GA2LEN and InterAirways document. Allergy 2007; 62(5):457-470. Everard ML. The relationship between respiratory syncytial virus infections and the development of wheezing and asthma in children. Curr Opin Allergy Clin Immunol 2006; 6(1):56-61. Lindemans CA, Kimpen JL. The immune response to viral lower respiratory tract infection. Adv Exp Med Biol 2005; 568:41-65. Ruzek MC, Pearce BD, Miller AH, Biron CA. Endogenous glucocorticoids protect against cytokine-mediated lethality during viral infection. J Immunol 1999; 162(6):3527-3533. Silverman MN, Macdougall MG, Hu F, Pace TW, Raison CL, Miller AH. Endogenous glucocorticoids protect against TNF-alpha-induced increases in anxiety-like behavior in virally infected mice. Mol Psychiatry 2007; 12(4):408-417. Silverman MN, Pearce BD, Biron CA, Miller AH. Immune modulation of the hypothalamic-pituitary-adrenal (HPA) axis during viral infection.Viral Immunol 2005; 18(1):41-78. Konstantinos AP, Sheridan JF. Stress and influenza viral infection: modulation of proinflammatory cytokine responses in the lung. Respir Physiol 2001; 128(1);71-77. Avitsur R, Hunzeker J, Sheridan JF. Role of early stress in the individual differences in host response to viral infection. Brain Behav Immun 2006; 20(4):339-348. Schmidt M, Enthoven L, van der Mark M, Levine S, de Kloet ER, Oitzl MS. The postnatal development of the hypothalamic-pituitary-adrenal axis in the mouse. Int J Dev Neurosci 2003; 21(3):125-132. Kruschinski C, Skripuletz T, Bedoui S, et al. Postnatal life events affect the severity of asthmatic airway inflammation in the adult rat. J Immunol 2008; 180(6):3919-3925. Silverman MN, Miller AH, Biron CA, Pearce BD. Characterization of an interleukin-6- and adrenocorticotropin-dependent, immune-to-adrenal pathway during viral infection. Endocrinology 2004; 145(8):3580-3589. Pinto RA, Arredondo SM, Bono MR, Gaggero AA, Díaz PV. T helper 1/T helper 2 cytokine imbalance in respiratory syncytial virus infection is associated with increased endogenous plasma cortisol. Pediatrics 2006; 117:e878-886. Dobbs CM, Feng N, Beck FM, Sheridan JF. Neuroendocrine regulation of cytokine production during experimental influenza viral infection. J Immunol 1996; 157(5):1870-1877. Sheridan JF, Stark JL, Avitsur R, Padgett DA. Social disruption, immunity, and susceptibility to viral infection. Role of glucocorticoid insensitivity and NGF. Ann NY Acad Sci 2000; 917:894-905. Graham NM, Douglas RM, Ryan P. Stress and acute respiratory infection. Am J Epidemiol 1986; 124(3):389-401. Graham NM, Woodward AJ, Ryan P, Douglas RM. Acute respiratory illness in Adelaide children. II: The relationship of maternal stress, social supports and family functioning. Int J Epidemiol 1990; 19(4):937-944. Cohen S, Doyle WJ, Skoner, DP. Psychological Stress, Cytokine Production, and Severity of Upper Respiratory Illness. Psychosom Med 1999; 61(2):175-180. Cohen S, Doyle WJ, Turner RB, Alper CM, Skoner DP. Childhood Socioeconomic Status and Host Resistance to Infectious Illness in Adulthood. Psychosom Med 2004; 66(4):553-558. Chida Y, Sudo N, Sonoda J, Hiramoto T, Kubo C. Early-life psychological stress exacerbates adult mouse asthma via the hypothalamus-pituitary-adrenal axis. Am J Respir Crit Care Med 2007; 175(4):316-322. Wright RJ. Prenatal maternal stress and early caregiving experiences: implications for childhood asthma risk. Paediatr Perinat Epidemiol 2007; 21(Suppl 3):8-14. Priftis KN, Papadimitriou A, Nicolaidou P, Chrousos GP. The Hypothalamic-pituitary-adrenal axis in asthmatic children. Trends Endocrinol Metab 2008; 19(1):32-38. Buske-Kirschbaum A, Jobst S, Wustmans A, Kirschbaum C, Rauh W, Hellhammer D. Attenuated free cortisol response to psychosocial stress in children with atopic dermatitis. Psychosom Med 1997; 59(4):419-426. Buske-Kirschbaum A, Geiben A, Höllig H, Morschhäuser E, Hellhammer D. Altered responsiveness of the hypothalamus-pituitary-adrenal axis and the sympathetic adrenomedullary system to stress in patients with atopic dermatitis. J Clin Endocrinol Metab 2002; 87(9):4245-4251. Buske-Kirschbaum A, von Auer K, Krieger S, Weis S, Rauh W, Hellhammer D. Blunted cortisol responses to psychosocial stress in asthmatic children: a general feature of atopic disease? Psychosom Med 2003; 65(5):806-810. Wamboldt MZ, Laudenslager M, Wamboldt FS, Kelsay K, Hewitt J. Adolescents with atopic disorders have an attenuated cortisol response to laboratory stress. J Allergy Clin Immunol 2003; 111(3):509-514. Barr J, Rapoport MJ, Tauber T, Hertzianu I, Cafri Y, Bistritzer T. The relation between adrenal function and the severity of bronchial hyperresponsiveness in children as measured by the methacholine provocation test. J Pediatr Endocrinol Metab 2002; 15(3):307-312. Ball TM, Anderson D, Minto J, Halonen M. Cortisol circadian rhythms and stress responses in infants at risk of allergic disease. J Allergy Clin Immunol 2006; 117(2):306-311. Chrousos GP, O’Dowd L, Uryniak T, Simpson B, Casty F, Goldman M. Basal and cosyntropin-stimulated plasma cortisol concentrations, as measured by high-performance liquid chromatography, in children aged 5 months to <6 years. J Clin Endocrinol Metab 2007; 92(6):2125-2129. Volovitz B, Ammir J, Malik H, Kauschansky A, Varsano I. Growth and pituitary-adrenal function in children with severe asthma treated with inhaled budesonide. N Engl J Med 1993; 329(23):1703-1708. Kannisto S, Korppi M, Remes K, Voutilainen R. Adrenal suppression, evaluated by a low-dose ACTH-test, and growth in asthmatic children treated with inhaled steroids. J Clin Endocrinol Metab 2000; 85(2):652-657. Ozbek OY, Turktas I, Bakirtas A, Bideci A. Evaluation of hypothalamic-pituitary-adrenal axis (HPA) suppression by low-dose (0.5 μg) and standard-dose (250 μg) adrenocorticotropic hormone (ACTH) tests in asthmatic children treated with inhaled corticosteroid. J Pediatr Endocrinol Metab 2006; 19(8):1015-1023. Bacharier LB, Raissy HH, Wilson L, McWilliams B, Strunk RC, Kelly HW. Long-term effect of budesonide on hypothalamic-pituitary-adrenal axis function in children with mild to moderate asthma. Pediatrics 2004; 113(6):1693-1699. Priftis KN, Papadimitriou A, Anthracopoulos MB, et al. Adrenal function improves in asthmatic children on inhaled steroids: a longitudinal study. Neuroimmunomodulation 2006; 13(1);56-62. Nakajima H, Takatsu K. Role of cytokines in allergic airway inflammation. Int Arch Allergy Immunol 2007; 142(4);265-273. Renauld JC. New insights into the role of cytokines in asthma. J Clin Pathol 2001; 54(8);577-589. Skoner DP. Balancing safety and efficacy in pediatric asthma management. Pediatrics 2002; 109(2 Suppl):381-392. Allen DB, Bielory L, Derendorf H, Dluhy R, Colice GL, Szefler SJ. Inhaled corticosteroids past lessons and future issues. J Allergy Clin Immunol 2003; 112(3 Suppl):S1-40. Zollner EW. Hypothalamic-pituitary-adrenal axis suppression in asthmatic children on inhaled corticosteroids: Part 1. Which test should be used? Pediatr Allergy Immunol 2007; 18(5):401-409. Bernstein, DI, Allen DB. Evaluation of tests of hypothalamic-pituitary-adrenal axis function used to measure effects of inhaled corticosteroids. Ann Allergy Asthma Immunol 2007; 98(2):118-127. Chrousos GP, Kino T, Charmandari E. Evaluation of the hypothalamic-pituitary-adrenal axis function in childhood and adolescence. Neuroimmunomodulation 2009; 16(5):272-83. Zollner EW. Hypothalamic-pituitary-adrenal axis suppression in asthmatic children on inhaled corticosteroids (Part 2) – the risk as determined by gold standard adrenal function tests: A systematic review. Which test should be used? Pediatr Allergy Immunol 2007; 18(6):469-474. Hindmarsh, P. Commentary: Exogenous glucocorticoids influence adrenal function, but assessment can be difficult. BMJ 2002; 324(7345):1083. Marcus-Permn Y, Tordjman K, Greenman Y, et al. Low-dose ACTH (1 microg) salivary test: a potential alternative to the classical blood test. Clin Endocrinol (Oxf) 2006; 64(2):215-218. Silva ML. Salivary cortisol to assess the hypothalamic-pituitary-adrenal axis in healthy children under 3 years old. J Pediatr (Rio J) 2007; 83(2):121-126. Törnhage CJ. Salivary Cortisol for Assessment of Hypothalamic-Pituitary-Adrenal Axis Function. Neuroimmunomodulation 2009; 16(5):284-9. GINA Report, Global Strategy for Asthma Management and Prevention. http://www.ginasthma.org/Guidelineitem.asp? ?l1=2&l2=1&intId=1561 (accessed February 20, 2010). Priftis KN, Papadimitriou A, Gatsopoulou E, Yiallouros PK, Fretzayas A, Nicolaidou P. The effect of inhaled budesonide on adrenal and growth suppression in asthmatic children. Eur Resp J 2006; 27(2):316-320. Dunlop KA, Carson DJ, Steen HJ, McGovern V, McNaboe J, Shields MD. Monitoring growth in asthmatic children treated with high dose inhaled glucocorticoids does not predict adrenal suppression. Arch Dis Child 2004; 89(8):713-716. Paton J, Jardine E, McNeill E, Beaton S, Galloway P, Young D, al. Adrenal responses to low dose synthetic ACTH (Synacthen) in children receiving high dose inhaled fluticasone. Arch Dis Child 2006; 91(10):808-813. Todd GR, Acerini CL, Ross-Russell R, Zahra S, Warner JT, McCance D. Survey of adrenal crisis associated with inhaled corticosteroids in the United Kingdom. Arch Dis Chil 2002; 87(6):457-461. Pedersen S. Clinical safety of inhaled corticosteroids for asthma in children: an update of long-term trials. Drug Saf 2006; 29(7):599-612. Wright RJ, Cohen RT, Cohen S. The impact of stress on the development and expression of atopy. Curr Opin Allergy Clin immunol 2005; 5(1):23-29. Hoffjan S, Ostrovnaja I, Nicolae D, et al. Genetic variation in immunoregulatory pathways and atopic phenotypes in infancy. J Allergy Clin Immunol 2004; 113(3):511-518. Wu Q, Chu HW. Role of infections in the induction and development of asthma: genetic and inflammatory drivers. Expert Rev Clin Immunol 2009; 5(1):97-109. Chrousos GP, Kino T. Glucocorticoid action networks and complex psychiatric and/or somatic disorders. Stress 2007; 10(2):213-219. Friedlander SL, Jackson DJ, Gangnon RE, et al. Viral infections, cytokine dysregulation and the origins of childhood asthma and allergic diseases. Pediatr Infect Dis J 2005; 24(11 Suppl):S170-176. Tantisira KG, Lake S, Silverman ES, et al. Corticosteroid pharmacogenetics: association of sequence variants in CRHR1 with improved lung function in asthmatics treated with inhaled corticosteroids. Hum Mol Genet 2004; 13(13):1353-1359. Slawik M, Reisch N, Zwermann O, et al. Characterization of an adrenocorticotropin (ACTH) receptor promoter polymorphism leading to decreased adrenal responsiveness to ACTH. J Clin Endocrinol Metab 2004; 89(7):3131-3137. Stevens A, Ray DW, Zeggini E, et al. Glucocorticoid sensitivity is determined by a specific glucocorticoid receptor haplotype. J Clin Endocrinol Metab 2004; 89(2):892-897. Wust S, van Rossum EF, Federenko IS, Koper JW, Kumsta R, Hellhammer DH. Common Polymorphisms in the Glucocorticoid Receptor Gene Are Associated with Adrenocortical Responses to Psychosocial Stress J Clin Endocrinol Metab. 2004; 89(2):565-573. Lorenz E, Mira JP, Cornish KL, Arbour NC, Schwartz DA. A novel polymorphism in the Toll-like receptor 2 gene and its potential association with staphylococcal infection. Infect Immun 2002; 68(11):6398-6401. Ahmad-Nejad P, Mrabet-Dahbi S, Breuer K, et al. The Toll-like receptor 2 R753Q polymorphism defines a subgroup of patients with atopic dermatitis having severe phenotype. J Allergy Clin Immunol 2004; 113(3):565-567. Eder W, Klimecki W, Yu L, et al. Toll-like receptor 2 as a major gene for asthma in children of European farmers. J Allergy Clin Immunol 2004; 113(3):482-488. Bornstein SR, Zacharowski P, Schumann RR, et al. Impaired adrenal stress response in toll-like receptor 2-deficient mice. Proc Natl Acad Sci USA 2004; 101(47):16695-16700. Bornstein SR, Ziegler CG, Krug AW, et al. The role of toll-like receptors in the immune-adrenal crosstalk. Ann N Y Acad Sci 2006; 1088:307-318. Biswas SK, Rahman I. Environmental toxicity, redox signaling and lung inflammation: the role of glutathione. Mol Aspects Med. 2009; 30(1-2):60-76. Carroll WD, Lenney W, Child F, Strange RC, Jones PW, Fryer AA. Maternal glutathione S-transferase GSTP1 genotype is a specific predictor of phenotype in children with asthma. Pediatr Allergy Immunol 2005; 16(1):32-39. Gilliland FD, Gauderman WJ, Vora H, Rappaport E, Dubeau L. Effects of glutathione-S-transferase M1, T1, and P1 on childhood lung function growth. Am J Respir Crit Care Med 2002; 166(5):710-716. Chung J, Oh SY, Shin YK. Association of glutathione-S-transferase polymorphisms with atopic dermatitis risk in preschool age children. Clin Chem Lab Med 2009; 47(12):1475-1481. Makarova SI, Safronova OG, Vavilin VA, Batychko OA, Gavalov SM, Lyakhovich VV. Atopy parameters in asthmatic children increase with accumulation of null-alleles of glutathione-S-transferase M1. Bull Exp Biol Med 2004; 138(5):460-462. Babu KS, Davies DE, Holgate ST. Role of tumor necrosis factor alpha in asthma. Immunol Allergy Clin North Am 2004; 24(4):583-597. v-vi. Yang IA, Holz O, Jorres RA, et al. Association of tumor necrosis factor-alpha polymorphisms and ozone-induced change in lung function. Am J Respir Crit Care Med 2005; 171(2):171-176. Park GY, Park JW, Jeong DH, Jeong SH. Prolonged airway and systemic inflammatory reactions after smoke inhalation. Chest 2003; 123(2):475-480. Wu H, Romieu I, Sienra-Monge JJ, et al. Parental smoking modifies the relation between genetic variation in Tumor Necrosis Factor-α (TNF) and childhood asthma. Environ Health Perspect 2007; 115(4):616-622. Yang IA, Fong KM, Zimmerman PV, Holgate ST, Holloway JW. Genetic susceptibility to the respiratory effects of air pollution. Thorax 2008; 63(6):555-63. Szyf M. The social environment and the epigenome. Biochim Biophys Acta 2009; 1790(9):878-85. Miller RL, Ho SM. Environmental epigenetics and asthma: current concepts and call for studies. Am J Respir Crit Care Med 2008; 177(6):567-573. Kaiko GE, Horvat JC, Beagley KW, Hansbro PM. Immunological decision-making: how does the immune system decide to mount a helper T-cell response? Immunology 2008; 123(3):326-338.